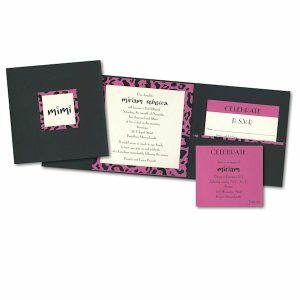 This trendy Bat Mitzvah invitation is raised printed on Natural White Linen card stock layered over Magenta card stock with a leopard pattern printed in black. The layered invitation is placed inside a Smooth Black Folder with trimmed pocket on the inside right and matching name tab on the front. 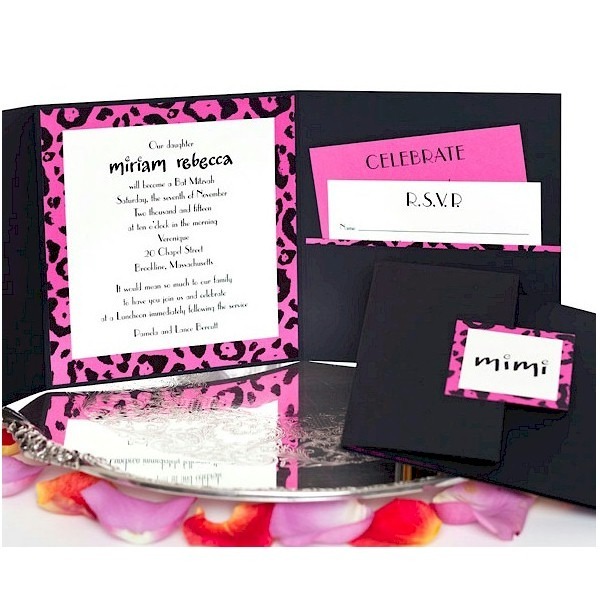 This trendy Bat Mitzvah invitation is raised printed on Natural White Linen card stock layered over Magenta card stock with a leopard pattern printed in black. The layered invitation is placed inside a Smooth Black Folder with trimmed pocket on the inside right and matching name tab on the front. Measures 6-1/4″ square. Shown with Black ink and Lettering styles Parisian (body copy) and Calligraphy #22 (name). The Reception card prints on oversized Magenta stock and the RSVP card prints on Natural White linen stock for a stacked appearance in the pocket. The Informal Note prints on folding Natural White Linen stock. This Bat Mitzvah invitation is accompanied by single Natural White Linen envelopes.